The Grand Opera House was built in 1870 by the Grand Lodge of Mason's to serve as their home location. Designed by Delaware architect Thomas Dixon in the Second Empire style, The Grand features a distinctive façade of cast iron adorned with Masonic images. In 1909, The Grand was briefly converted into a regular stop on the vaudeville circuit and then transitioned into a movie theater. The building was allowed to fall into decline and sadly closed its doors in 1967. Over the next few years, a thoughtful and complete restoration was undertaken. The Grand was rededicated on February 1, 1973, and began again to present the finest performing artists from around the world. 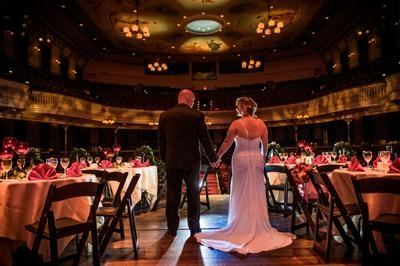 Perfect venue with various spaces to provide a rustic wedding atmosphere for someone looking to hold an event outside of the ordinary types of locations typically offered. Please see attachment for a list of preferred caterers. Rental rates starting at $135. Rate is dependent on event space. Tables and chairs included. We can provided you with a list of preferred caterers, as we do not provide catering services onsite. Spacious, artistic room with a bar and cafe´ area. The perfect room for a variety of events including press conferences, holiday parties, receptions, lunches/dinners, and more! The Opera House has been home to some of the world's most gifted artist for over 130 years. As historic as it is aesthetic, the 1140-seat theater represents both the physical and symbolic heart of The Grand. Victorian-style two level parlor with crystal chandeliers and beautiful bar. The salon is perfect for cocktail receptions, bridal showers, baby showers, and other intimate gatherings. Enormously stunning bright space with high ceiling, large windows and hardwood flooring. Great for large receptions, dinners, parties, live entertainment, and meetings. Began as the historic Aldine Theater built in 1921. Then The Grand acquired the lot in 1992 to create the Edith and Alexander F. Giacco Building in 2000. Now it's a cozy 305-seat theater which occupies the first floor with a large lobby area including a café area and a bar! This lounge has a cozy welcoming atmosphere with contemporary furnishings and signed posters of memorable Grand performers. The muse is perfect for cocktail receptions, bridal showers, baby showers, and other intimate gatherings. Atmosphere/Decor: Includes leather chairs, couches and petite wooden tables. A room with rustic charm, dimmable lighting, exposed stone wall, and a catering prep area. Great space for meetings, lectures, receptions, dinners, holiday parties, networking events, intimate gatherings and so much more! My experience as a event planner with The Grand (in particular Jessica) was fantastic. She was responsive, accommodating and flexible. Her professionalism was much appreciated and The Grand is always a great space for any event! It is well maintained, clean and functional. The staff that was there the night of the party was welcoming, helpful and professional also! I can't say enough about how positive my experience was and I'd love to work with them again. Thank you! We just recently had a business event at the Grand Opera House. The space is gorgeous, the staff is wonderful, and extremely helpful. I would recommend the space to anyone for a small or large event. We will definitely be coming back to use the space again.